From the book ... "I did not eat the goldfish"
Sellafield is Britain's most famous nuclear site. At Sellafield the first commercial nuclear power station became operational. At Sellafield plutonium was produced for nuclear weapons and a major disaster was narrowly averted in 1957. At Sellafield there is now a nuclear waste reprocessing plant. This postcard shows the 'Tunnel' Entrance to the Visitors' Centre - as it was. 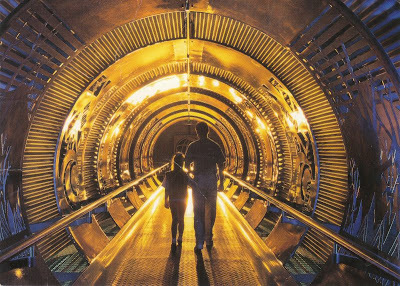 We visited about ten years ago and had a go on a lot of high tech exhibits which helped explain nuclear power. The Visitors' Centre once attracted about 1,000 people per day, but its popularity declined, and it has now been converted to a conference centre.